Today we were at Galatea Fine Arts in Boston, and I finally had a chance to see the February show, which I really enjoyed. Two of my pieces have been on display this month in the "Artists' Alcove". This was the first time I saw hanging on the wall there, so I took a picture. These are two of my mountain landscapes: "Storm Coming over Pink Mountains" and "Purple Ridge", both done with acrylics. These paintings will be up for the rest of the weekend, and then on Monday a new show goes up for March. 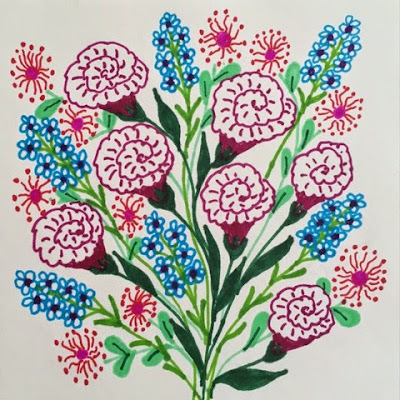 To find out more about Galatea, go to http://galateafineart.com. 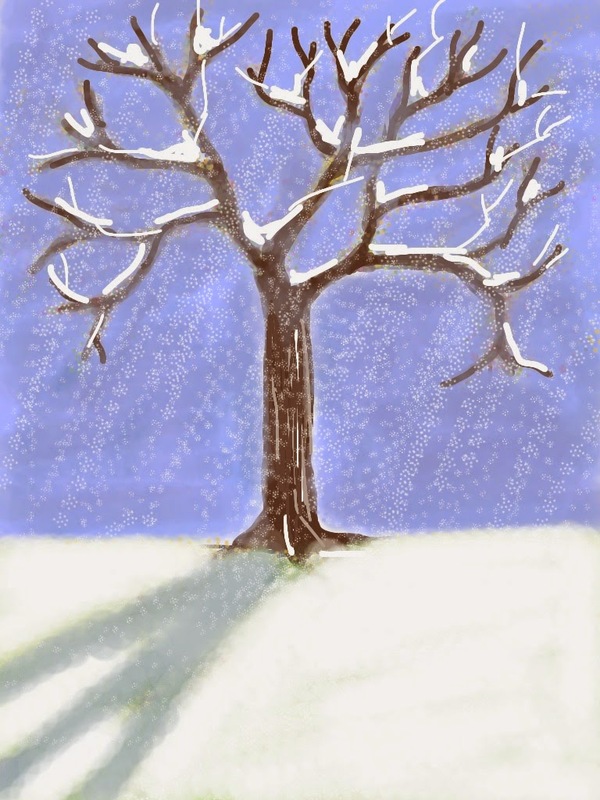 I didn't have a chance to paint today, so I thought I would post one of my snowstorm pictures. 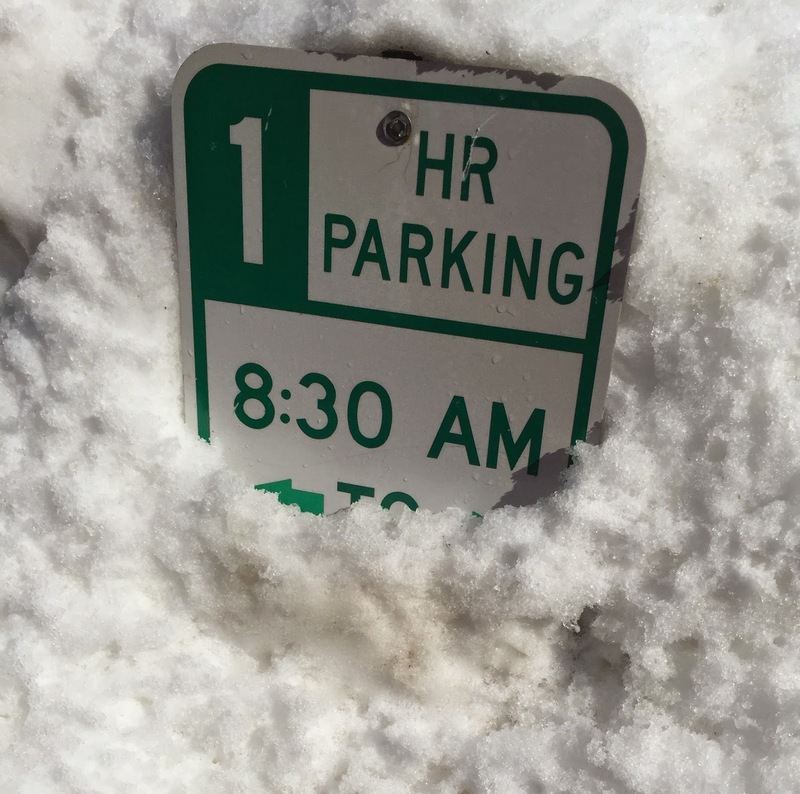 This is a photo that I took on February 22, a picture of a parking sign buried in the snow. I worked on this painting late this afternoon. I am painting a scene at Appleton Farms (Ipswich, MA), based on photos that I took there in October. (The photos are posted on this site, January 2nd and 3rd.) Today I started by trying to work out how to indicate fallen leaves on the ground. I also worked on light and shadow on the tree, especially the trunk, as well as on the ground. And I fixed a number of small problems. This is my oil bar painting in progress. I am working from photos that I took in October at Appleton Farms in Ipswich, MA. (Reference photos are posted on this site on January 2nd and 3rd.) Today I worked on the hillside itself, which had a thin undercoat of paint. I modified the color to make it a brighter and sweeter green, and now it is closer to what I want. I also changed the shape of the hillside on the left of the canvas. I had blocked in another stand of trees in the distance, but decided against it, so I painted over them. Here is my painting in progress, an oil bar landscape. I am working from photos that I took in late October at Appleton Farms (in Ipswich, MA). If you are interested, my reference photos are posted on this site, January 2nd and 3rd. Due to a rushed morning schedule and super cold temperatures in my home studio, I didn't get a chance to paint until late afternoon. I used my black and white reference photo again, and added some patches of light on the tree trunk and branches. I also changed the color of the dirt road. That's all I had time to do today. Although the painting looks darker, that's just because I photographed it in the late afternoon. 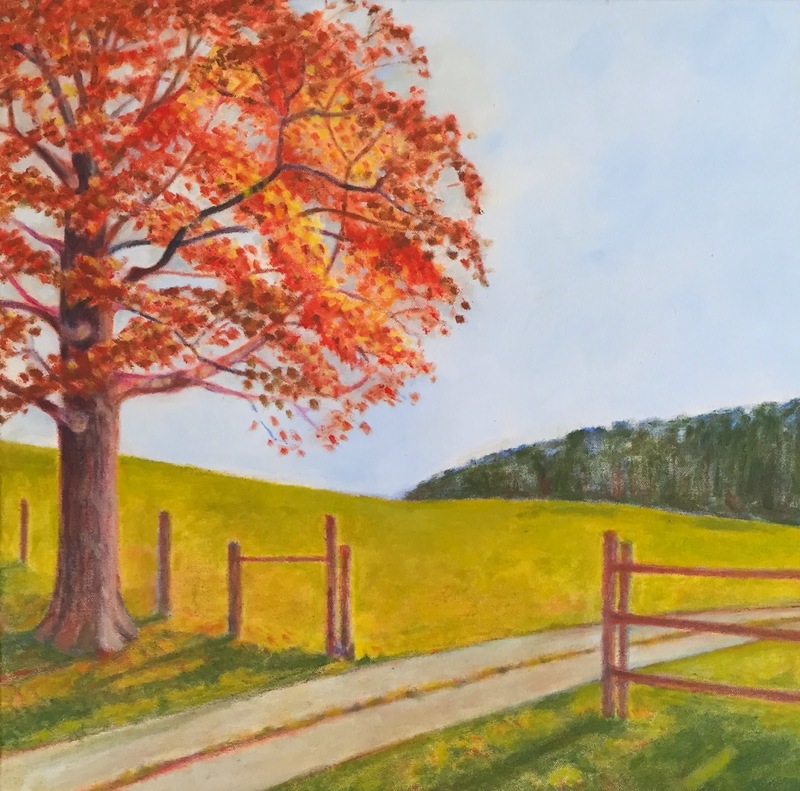 I have been working on a oil-bar landscape of a late October scene that I photographed at Appleton Farms (in Ipswich, MA). 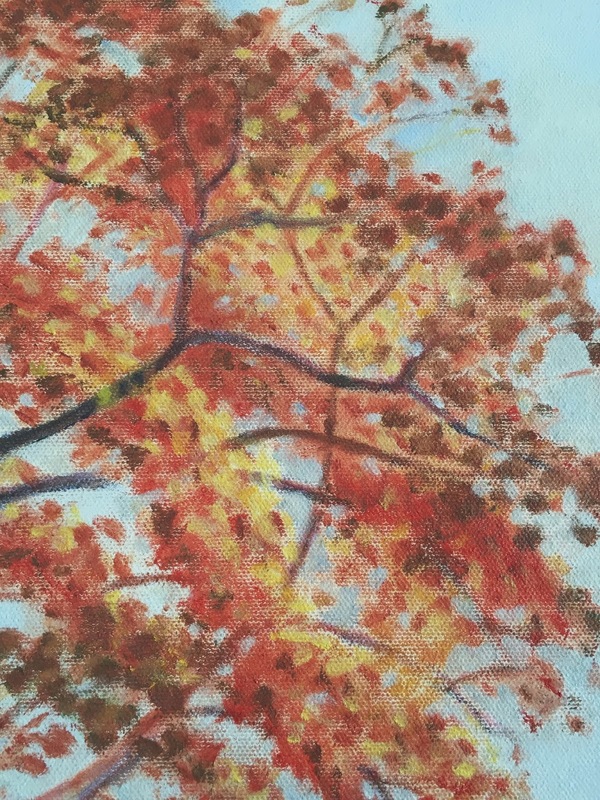 I took this closeup yesterday and it shows what I was working on, which was negative space: adding light blue strokes among the branches and leaves to allow the sky to be seen through the leaves . This morning I worked on this painting, a landscape of a scene at Appleton Farms in Ipswich, MA, based on photos that I took there in late October. (I have posted my reference photos here, January 2nd and 3rd.) Today I mixed some pale blue and concentrated on sharpening the lines of the branches and defining the negative spaces, adding touches of pale blue to suggest the sky peeking through the leaves. This involved making a lot of small changes that might not be noticed one at a time, but taken together, I think they do make a difference. This is my oil bar painting as it looked after yesterday's painting session. I am working from photos that I took in late October at Appleton Farms in Ipswich, MA. (My reference photos are posted here on January 2nd and 3rd.) Yesterday I used iPhoto to transform one of my reference photos to black and white. (I posted it here last night.) That black and white photo really helped me to see lights and darks in the leaves, and made me a lot more confident about what I am doing. I mixed burnt orange with green and used it to add more shadows to the leaves, using my black and white photo as a guide. I also used more dark blue shadow on the tree trunk so the leaves would stand out better. I also put some dark green on the trees in the distance. 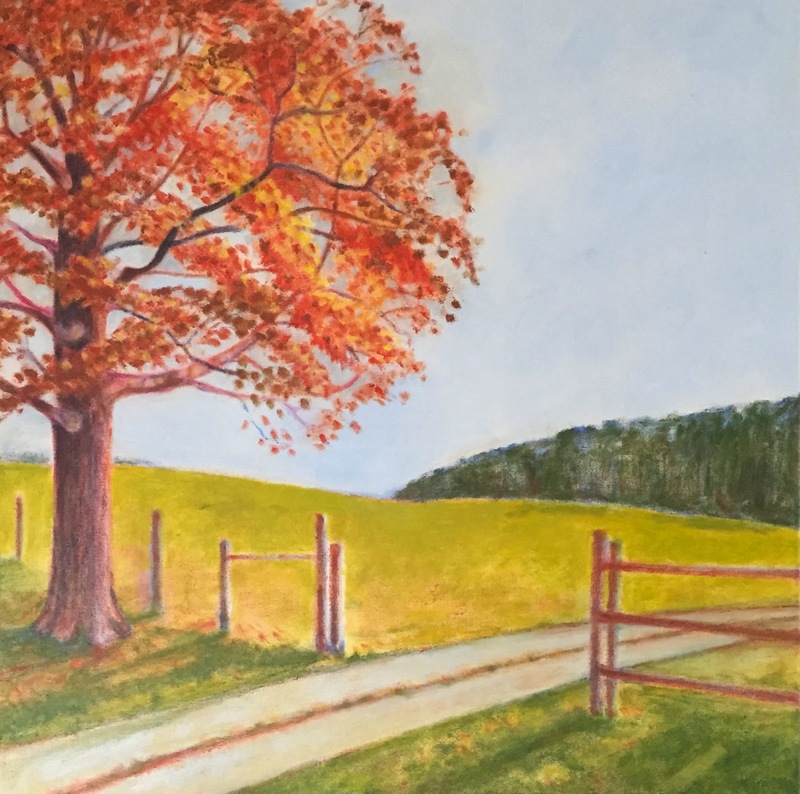 I have been working on an oil bar painting of this tree and hillside at Appleton Farms (Ipswich, MA), working from photos that I took there in late October. In trying to paint the tree, I have been struggling with light and shadow in the foliage. I think it is hard for me to see the differences in light and dark because I am so distracted by the many colors in the autumn tree. So this morning, I decided to go back to my photos and see what happened if I looked at the scene in black and white. So I used iPhoto to make a black and white version of one of the photos. It was very useful for painting (and I plan to post the painting tomorrow). But I liked the black and white photo for its own sake, and decided to post it here. I didn't get a chance to work on this painting until late afternoon. 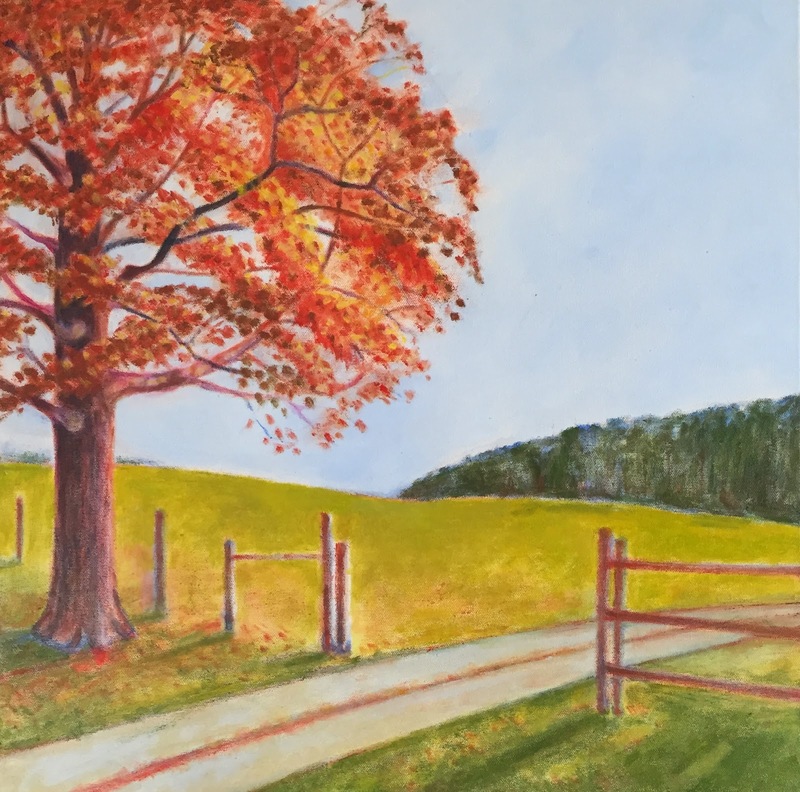 I am painting this scene at Appleton Farms in Ipswich, MA, from photos that I took in October. (My reference photos are posted here, January 2nd and 3rd.) This afternoon I continued to struggle with areas of light and dark in the foliage. In the photo (and in this painting) the sun is beyond the tree with shadows cast toward the viewer. So the tree is back lit, and that means that the leaves in shadow are closer to the viewer. I am using pale yellow and dark green to indicate light and shadow; while I am working, exaggerated differences in color and value help me to see what I am doing, but I will tone things down a bit before I am finished. I also added more shadow to the foreground. This is the landscape I have been working on. I am using oil bars to paint a scene at Appleton Farms in Ipswich, MA. I took some photos there in late October, and am using them as reference photos. (They are posted here January 2nd and 3rd.) I worked for just a short time today, but did make a start on putting in the shadows in the foreground. I also added a bit of light yellow to the foliage. Here is my oil bar painting as it looked after I finished my painting session this morning. 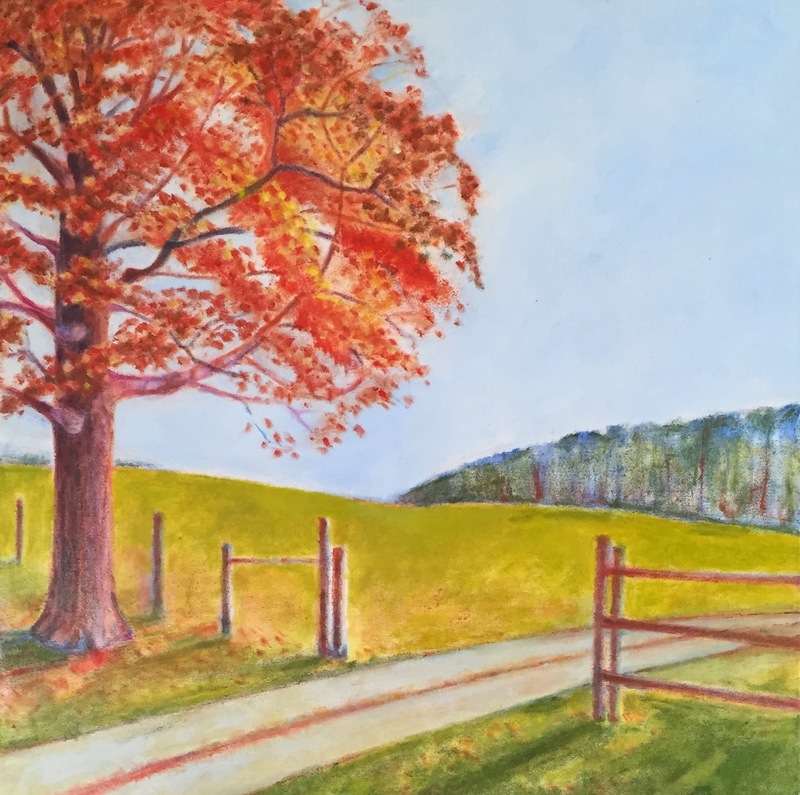 I am painting a scene at Appleton Farms (in Ipswich, MA), working from photos that I took there in late October. (My reference photos are posted on this site, January 2nd and 3rd). Today I started by looking at my photos on the computer, so I could zoom in and study the lights and darks in the foliage. This was a good idea and it really helped. The area beyond the fence is in sunlight, but the area up to to the fence is in shade. (I am starting to put the shadows in.) So the part of the tree closest to the picture plane will be in shadow, including the foliage as well as the tree trunk. I put that idea into practice by applying areas of shadow for foliage of some branches that reach toward the picture plane. When it was almost time to stop for the day, I realized that I hadn't made those shadows consistent with which branches cross "in front" of other branches, and therefore read as closer. I started to work on that, but was running out of time. But at least I think I am on the right track. Yesterday I posted a little bouquet that I drew with fine-line felt-tip pens. I had so much fun that I decided to draw another one and here it is. Too much snow here north of Boston. Today I drew this little bouquet with my recently acquired set of colored Sharpies (fine-line pens). I worked from imagination to create this winter fantasy. I really had fun playing with colors and patterns. Here's another photo that I took yesterday. 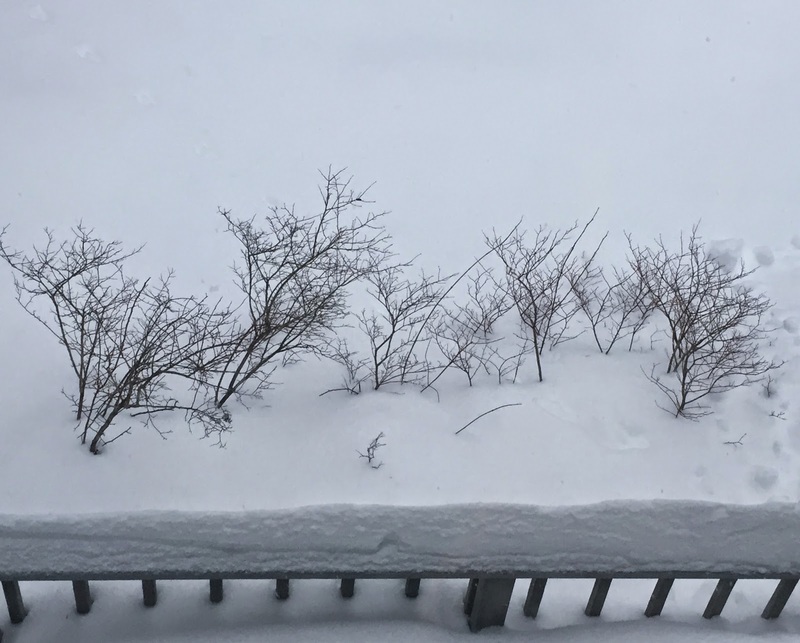 This was shot from a second floor window, looking down at the tops of (buried) blueberry bushes and (buried) deck railing. I liked the way the dark branches looked against the snow, so I took this picture. I used iPhoto to crop this image out of the original version. I also used Painter and some digital pastel to get rid of a distracting little withered leaf on one of the bushes. In case you haven't heard, we are having a run of snowstorms here north of Boston. In addition to an astounding amount of snow, we are also seeing some amazing (and potentially dangerous) icicles. I decided to take some pictures of them today. I cropped the original photo to get a composition that shows window and icicles. I thought this photo looked good in black and white. Here is my oil bar painting as it looked after I worked on it this morning. 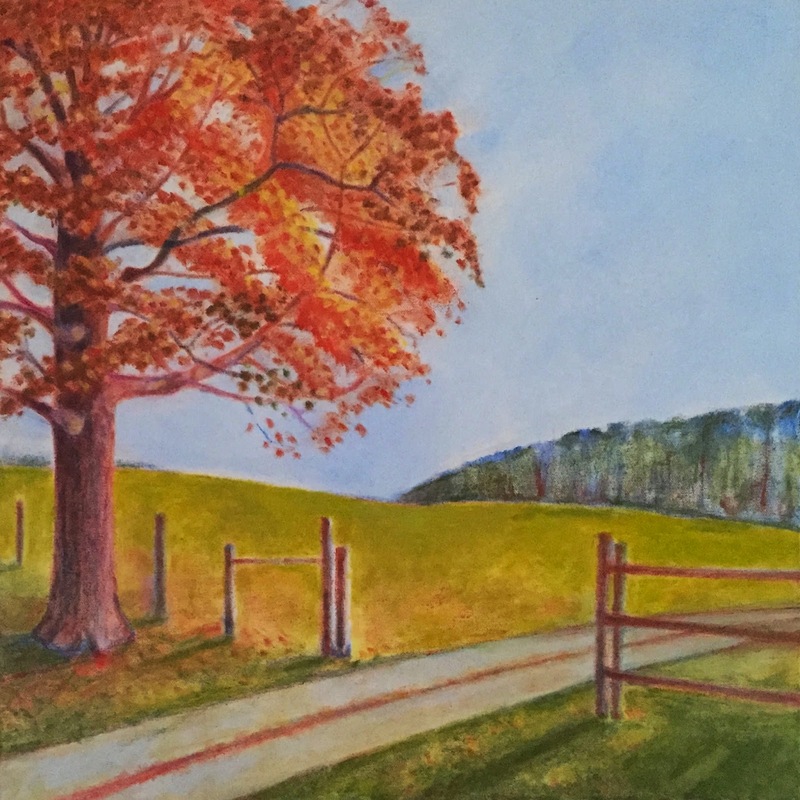 I am painting this scene at Appleton Farms (in Ipswich, MA) from photos that I took there in late October. (My reference photos are posted on this site, on January 2nd and 3rd.) Today I worked on the path, struggling to get it to behave. The perspective is a bit tricky and I think I still have corrections to make. I also worked on the lines of the fence. I spent a little time working on this painting this morning. I am working from photos that I took in late October at Appleton Farms (Ipswich, MA). You can see my reference photos posted here on January 2nd and 3rd. I have been working on the foliage, which is the hardest part. But today, apart from adding a little yellow to the leaves, I decided to concentrate on the hillside. I put down some yellow-green, but it probably won't be the final color. I used some darker green to begin to establish shadows in the foreground. This morning I worked on this painting for a while. 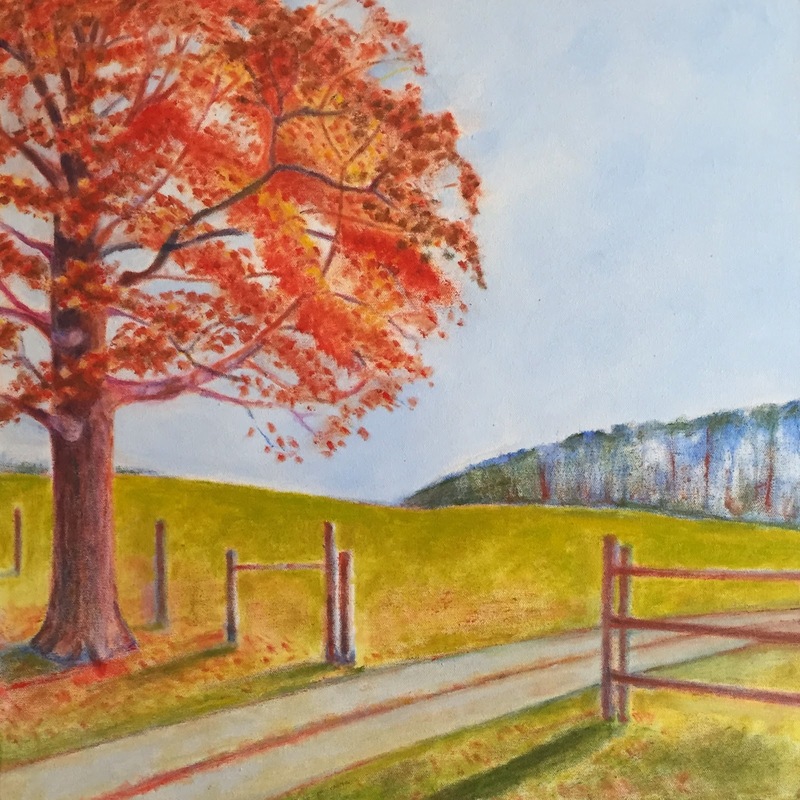 I am using oil bars to paint a late October scene that I photographed at Appleton Farms (in Ipswich, MA). (My reference photos are posted here on January 2nd and 3rd.) Today I was still concentrating on establishing the shapes of the foliage, and doing a little bit of work on light and shadow on the tree. I also did a little bit of work on the foreground and on the line of trees in the background. Today I got back to this painting after over a week. (The delay was a combination of cold temperatures in my home studio and simple procrastination as I get to the more difficult parts of this painting.) 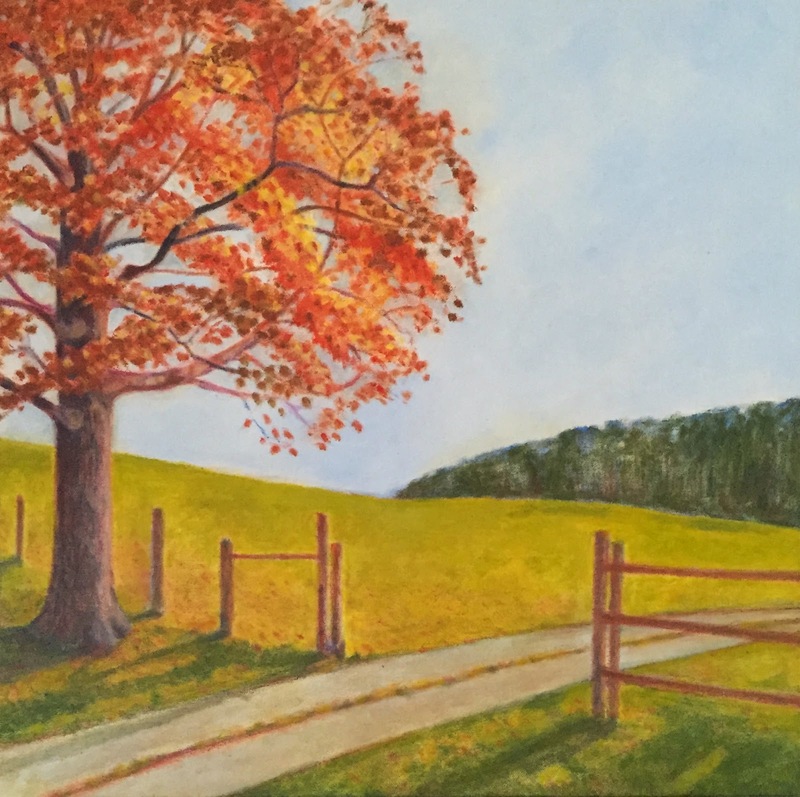 This oil bar painting is based on photos that I took in late October at Appleton Farms, in Ipswich, MA. (My reference photos are posted here on January 2nd and 3rd.) I am still working on placement of the foliage and today I broke out the burnt orange and red, which was fun. I also made the tree trunk a little darker to maintain contrast so I can see what I am doing. One of the hardest things is just trying to understand what I see, and in this case, I am trying to understand the light and dark areas of the foliage. This image started with another photo that I took the other day at Waring School (here in Beverly, MA). 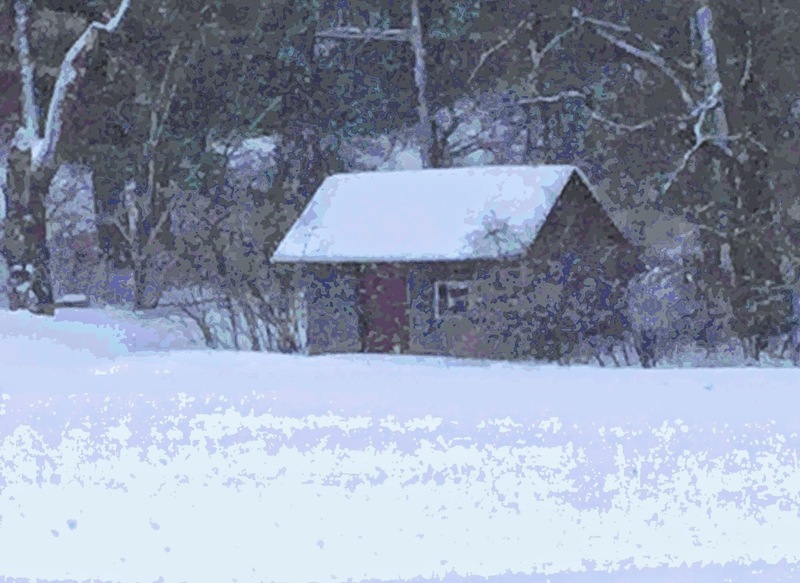 I liked the way this little shed looked at the edge of a snowy field, with trees behind it. I cropped this out of the original photo and then used Painter to add the posterizing effect. Yesterday's post was my photo of this beautiful tree on the Waring School campus here in Beverly, MA. Tonight I edited the original version in Painter, adjusting the values to make it easier to see the beautiful tree trunk. Then I added a posterized effect. I took this picture today from the library building at the Waring School (in Beverly, MA). 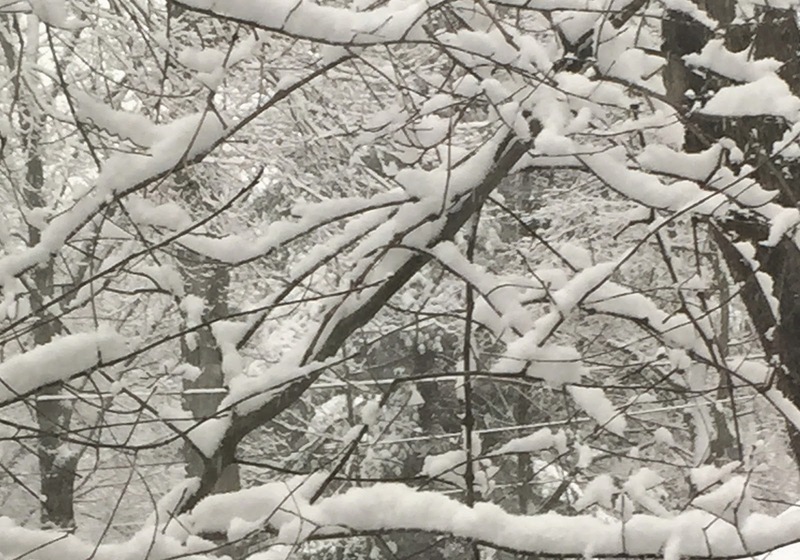 I looked out a window at the snow and saw this tree just outside. I liked the moss and snow on the trunk and the field and trees in the background, so I took some pictures. Tonight I cropped this image out of the best one. The idea was to show a tree going through four seasons of the year. 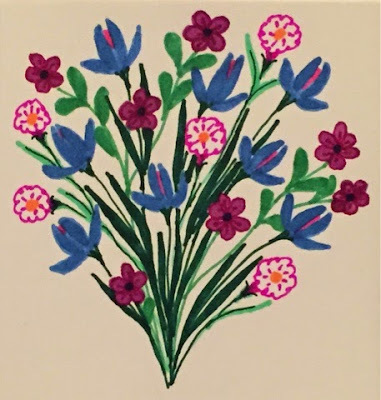 I posted this for Jewish arbor day (aka Tu B'shevat), but it is also a good reminder that spring follows winter. Here's a little video that shows a tree through the four seasons. I am posting this today for a Tu B'Shevat (the new year of the trees, my favorite holiday in the Jewish calendar). But no matter what calendar you follow, it is good to remember that spring will follow the winter. I drew this on the Brushes app on my iPad, which captures a stroke-by-stroke animation as you draw. (Tomorrow I plan to post the drawing.) If you are tired of winter, just press play. Here's another snow scene, this one also cropped from the photos that I took on January 24 (pre-blizzard and now two snowstorms ago). I liked the way the snow looked on the branches of the blueberry bushes, so I took some pictures. Tonight I cropped the original to get this composition. I wonder if this might make a good digital woodcut. I have been taking snow pictures for days, but just now starting to edit them. Tonight I cropped this image from a photo that I took about a week ago (January 24) which was pre-blizzard. 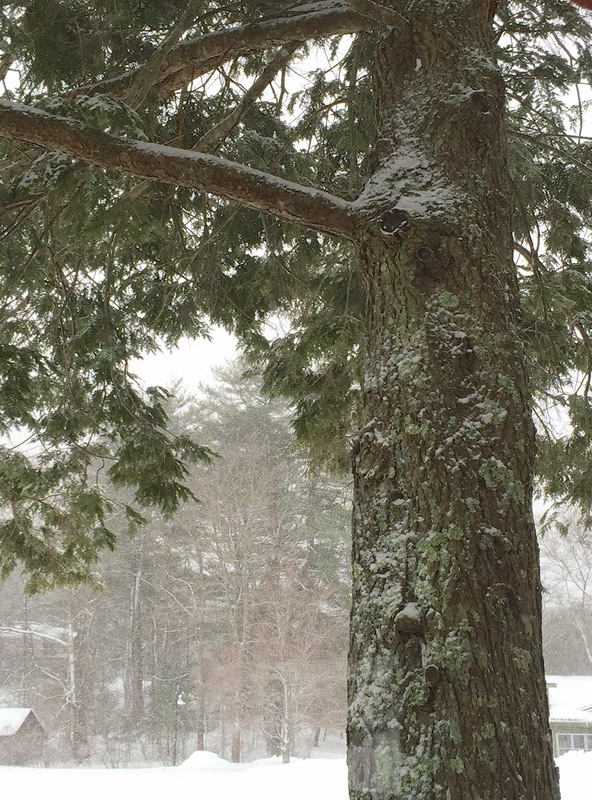 I love the way the snow reveals the lines of the tree branches.